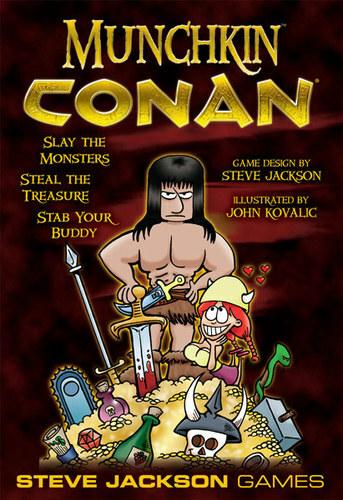 Munchkin Conan is a new 168-core set that draws from the entire Conan mythos, giving players Conan's most fabulous treasures, and pitting them against the barbarian's most terrifying foes. Munchkin Conan is entirely compatible with the Munchkin line of games. Look for Munchkin Conan in July. Fort Deadly! The Creepy Isolated Cabin of the Dead! Resurrection! Introducing the popular double-sized "Dungeon" cards to the Munchkin Zombies mayhem, Hideous Hideouts features places where the zombies can find more yummy braaains! Look for Munchkin Zombies 3: Hideous Hideouts, the second expansion to Munchkin Zombies, this August.